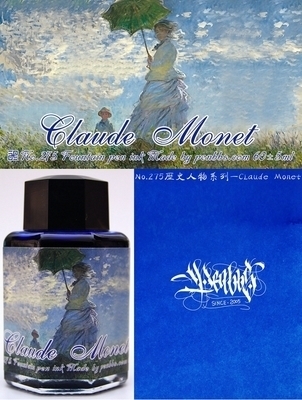 Claude Monet is a blue fountain pen ink with high saturation. Claude Monet is a French painter who founded French Impressionist painting and contributed greatly to plein air landscape painting. The ink's color is reminiscent of the summer sky in a Claude Monet painting called "Woman with a Parasol - Madame Monet and Her Son".